Hydro-excavation involves the use of high-pressure water and industrial vacuum equipment in order to safely excavate around utilities and other sensitive underground structures. This method is non-destructive and has the advantage of being effective even with frozen ground. Along with hydro-excavation equipment, GLPV offers a full line of services related to underground cleaning, such as catch basin cleaning, sewer line jetting, and a variety of other related services. 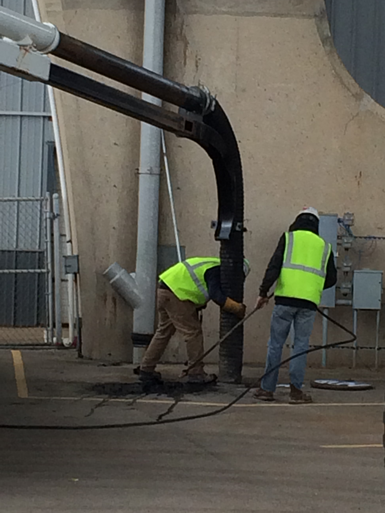 Hydro-excavation is a safe and non-destructive form of excavation. By using high-pressure water and industrial-strength vacuums, hydro-excavation safely breaks up soil and removes it with surgical precision through vacuums into a debris tank. This highly-effective task is perfect for working in situations where there is danger of damaging underground utilities. Because hydro-excavation uses water to break up the soil, there is no risk of utility damage while using this technology. Hydro-excavation is a non-mechanical process that uses pressurized water and a high flow of moving air to simultaneously excavate and evacuate native soils at a controlled rate. The soil and water slurry are conveyed via a tube to a truck-mounted debris tank. This process allows for quick, clean, and precise evacuations which require less backfill, less labor force, less restoration, and less environmental impact than conventional digging methods. A controlled-flow water stream allows for surgeon-like accuracy. Because we remove only material necessary for repair or inspection, minimal material needs to be removed when compared with the large, less-than-accurate excavator or back-hoe bucket. Line-jetting, also known as water jetting, is the process of using high, and ultra-high pressure water cleaning to unclog plumbing pipes and drain line systems. These obstructions hinder the flow of utility lines and can result in thousands of dollars in damage and emergency services. Catch-basin cleaning should be performed at any facility that has an on-site storm-sewer system that includes catch basins and manholes. Catch-basin cleaning is vital to maintain the flow of surface water into the storm system to keep your property clear and free of standing water. It is also the job of the catch basin to capture sediment, leaves, contaminants, debris, and pretty much anything else anyone chooses to drop on the ground while at the same time directing your rain run-off away from your property. Regular maintenance of catch basins and inlets is necessary to ensure they function properly. Individual basin cleaning is the first step to maintaining a functioning drainage system. Many large ponds in the Midwest have an excessive amount of sludge and debris build-up from lack of maintenance. We can handle any project, whether it is pumping all of the sludge out of the pond or simply setting up a routine maintenance schedule. The commercial pond-cleaning process for sludge removal consists of:draining water from the pond, vacuuming pump sludge out of the pond, and hauling it off the property. Once your commercial pond cleaning has been completed, it is important to establish a routine maintenance program to help with control of algae and water quality. A regularly maintained biological ecosystem will ensure clean water for the life of the pond.